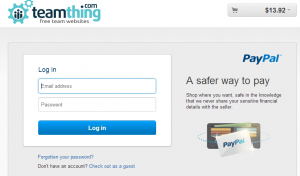 We are delighted to announce that teamthing.com has partnered with trusted domain seller eNom to enable you to purchase domain names straight from your dashboard. If you need a new domain name then you can now easily check the availability of the name you desire and buy it straight from your teamthing.com dashboard. Once your domain purchase is complete you can then use it as the new address for your free or ‘pro’ teamthing.com site. Our domain name prices are highly competitive with .com names costing less than £9 and .co.uk less than £7! Click the ‘Purchase Domain’ tab to show the ‘Check Domain’ area. Check to see if your domain is available. Type the domain name that you wish to purchase and choose the ‘tld’ e.g. ‘.com’ from the drop down. Click the ‘Check Domain’ button to check if the domain is available. If the domain is available the text below the button will change and the cost of the domain will also be listed. To proceed with the purchase click the ‘Buy Now’ button. Pay using a paypal account or using your credit card. You will be then brought to a PayPal page where you can pay using a PayPal account or by using a credit card. Once your purchase is complete you will be brought back to ‘Domain Mapping’ screen. To complete the new domain process i.e. to use your newly purchased domain as the new name for your teamthing website, just fill in your new domain details in the ‘Map Domain’ tab.